It's 19:22 in Villars-sur-Ollon, Switzerland right now. Villars-sur-Ollon: roundshot 360° Panorama Chaux Ronde, 0 miles away. Villars-sur-Ollon: 360° Panorama Place de Bretaye, 0 miles away. 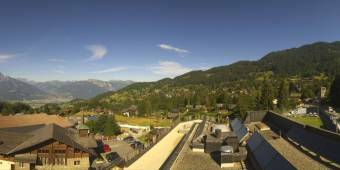 Villars-sur-Ollon: roundshot 360° Panorama Alpe Les Chaux, 0 miles away. Villars-sur-Ollon: roundshot 360° Panorama Aiglon College, 0 miles away. Leysin: Chalet Sybil, 3.6 miles away. Leysin: roundshot 360° Panorama Kuklos, 3.6 miles away. Bex: Place du Marché, 3.8 miles away. Aigle: roundshot 360° Panorama Aigle, 4.3 miles away.